Papple pears are small to medium in size and are round to conical in shape, similar in appearance to an apple with a short, brown stem. 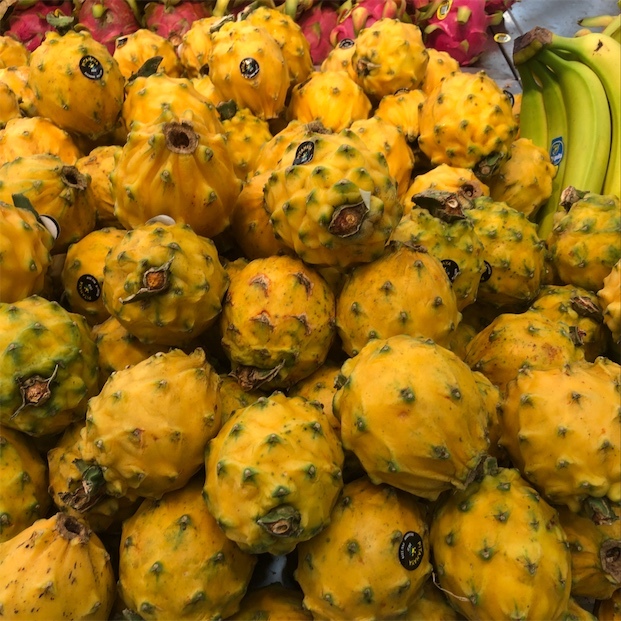 The smooth green skin transforms to a mottled, almost iridescent, orange-red when ripe and is covered in many prominent lenticels and yellow patches. The flesh is cream-colored to ivory, firm, crisp, moist, and dense, encasing a very small central core with tiny black-brown seeds. When ripe, Papple pears are crunchy, juicy, and sweet with a floral aroma. Papple pears are available in the late spring through summer in the southern hemisphere, which is in the fall and winter in the northern hemisphere. Papple pears, botanically classified as a hybrid between the European pear, Pyrus communis, and the Asian pear, Pyrus pyrifolia, are a new variety that are members of the Rosaceae family along with apples and peaches. 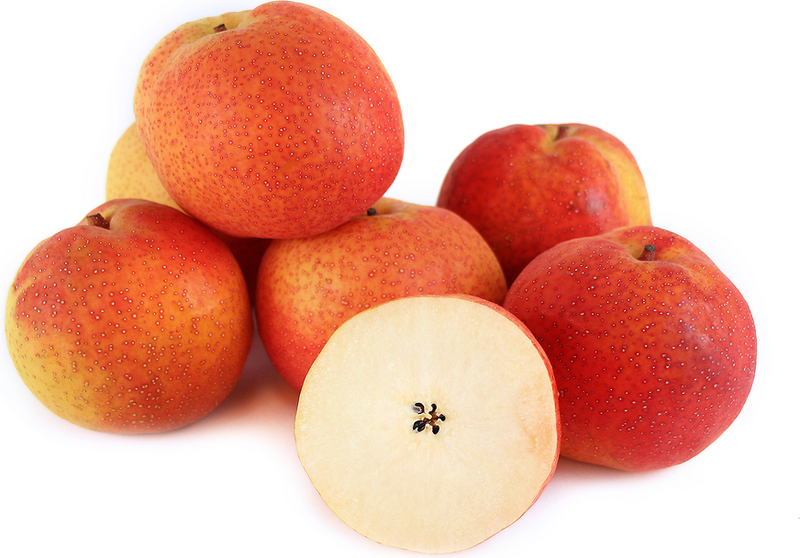 Originally labeled T109 and Prem109, Papple pears are not an apple but are unique in that they have the appearance and texture of an apple and the taste of a pear. This variety has acquired its unique hues and flavor characteristics from many different varieties within the Asian and European categories, and Papple pears were developed by the Plant and Food Research Station in New Zealand to create a new hybrid category known for its long storage capabilities and appealing visual novelty. Papple pears are also known in Singapore as the Sunshine pear and are exported globally for fresh eating. Papple pears are an excellent source of dietary fiber and vitamin C and also contain some antioxidants. Papple pears are best suited for raw applications as their crunchy texture, and sweet flavor is showcased when consumed, fresh out-of-hand. They can be sliced and consumed as a snack, layered in sandwiches such as grilled cheese and paninis, used as a topping on pizza, mixed into a stir-fry, or tossed into green salads and pasta salads. They can also be used as a topping for soups, sliced and dropped into cocktails, or served with ice cream and sorbets. Papple pears compliment cheeses such as brie, blue, gorgonzola, and parmesan, arugula, kale, radicchio, spinach, grapes, honey, nuts such as walnuts, pecans, pine nuts, and almonds, and herbs and spices such as mint, cilantro, cinnamon, and nutmeg. They will keep for several weeks when stored in the refrigerator. Despite being created in New Zealand, Papple pears are not currently sold domestically as they are earning a larger profit in export markets. Papple pears were predicted to do well in Asia as they showcase many characteristics that are popular within the Asian pear market, but it was also popular in Europe and the United States as the market shifts to desiring new varieties with unique attributes for fresh eating. Papple pears earned their nickname in Europe from the well-known retailer Marks & Spencer. While selling the unnamed variety, they decided the pear’s name should be a play-on the pear’s similarity in appearance and texture to an apple, but with the flavor of a pear. The nickname Papple was successful in piquing consumer’s curiosity, and today the variety is largely known by this name. Papple pears were created in 1996 at the Plant and Food Research Station in Motueka, New Zealand. They were released for public sale in the spring of 2012, and today Papple pears can be found at select retailers in Asia, Europe, and the United States. Recipes that include Papple Pears. One is easiest, three is harder. Someone shared Papple Pears using the Specialty Produce app for iPhone and Android. Sharer's comments : Papple Pears spotted at Royal Randwick Shopping Centre.